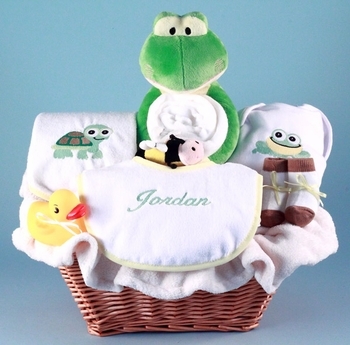 With gender-neutral colors and design, this basket features an irresistibly cute frog theme. 100% cotton layette items are made in the USA from domestically grown cotton. If desired, we will embroider the baby's name on the bib - a thoughtful touch that is sure to be appreciated. Gift wrapping with tulle and ribbons is included.